Boy, are we happy to see the sun! And so are our goats! We just had two more “litters” of baby goats, twins from two does — two bucklings and two doelings. They must not have wanted to wait and see if more cold weather was in the future. All babies are doing very well. So is Sir, the baby who nearly died due to exposure after being born outside in the cold rain. He’s up and playing. This morning he discovered his ears. He spent a lot of time twitching his head to see them flap. And he’s starting to bounce and jump too. He won’t stay in his box during the day so I’m putting him down with his mom. 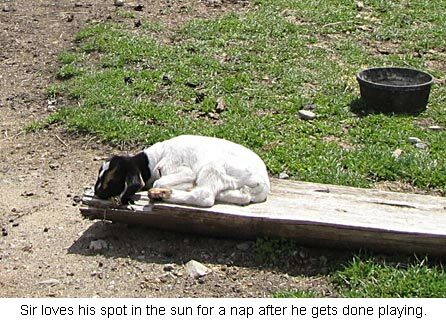 He can play, nibble on grass, and when he’s tired, he finds a sunny spot to nap in. One of his favorites is on a half log near the gate. His mom watches over him but won’t let him nurse, yet. But she is a good milker and gives a gallon a day. Because Sir only eats three pints so far, I see a batch of yogurt in our future. I’m busy transplanting tomatoes. Whew, are there a lot! And because I strained my shoulder last week, I can only do it for a little while then need to give it a rest. But like the tortoise, it’s getting done, although slower than I’d like. Yeah, it’s “organized” until the weeds come up! I’m dedicating extra time this year to beautify that one bed. I did that last year with another and it worked, instead of spreading myself way too thin and getting frustrated. Sure you can borrow Will. But I have a hard time getting him to leave the homestead….. 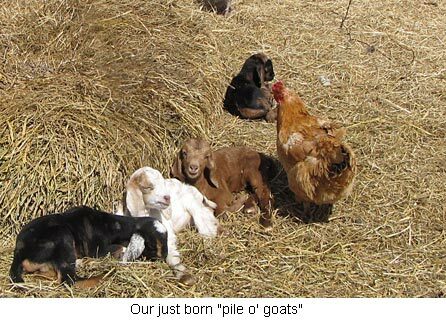 The little goatie babies look so tiny next to that chicken and aren’t they so sweet. 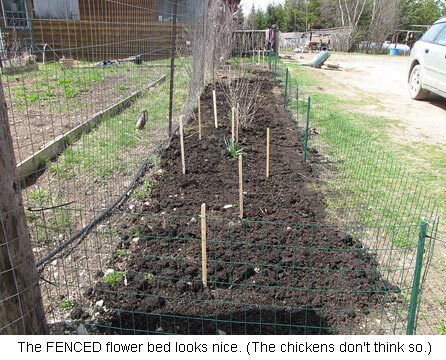 The new flower bed is looking very organized. Can I borrow Will? I am sure it’s going to be beautiful. I hope your shoulder heals quickly, Miss Jackie.